In another shocking incident of intolerance in Pakistan, activist Sabeen Mahmud was shot dead by unidentified gunmen in Karachi on Friday. Her crime? Holding a discussion about Balochistan. Sabeen was the director of The Second Floor (T2F), and she was shot when she was leaving T2F on Friday night. She died on her way to the hospital and doctors retrieved five bullets from her body. Her mother also sustained bullet wounds and is critical. On Friday, T2F had organised a talk on Balochistan: ‘Unsilencing Balochistan Take 2: In Conversation with Mama Qadeer, Farzana Baloch & Mir Mohammad Ali Talpur. According to its website T2F is ‘A community space for open dialogue, T2F features a café and bookshop and hosts poetry readings, meetups with writers, talks, debates, theatre performances, film screenings, open mic nights, jam sessions, and standup comedy.’ According to Wikipedia, ‘Baloch nationalism is a movement that claims the Baloch people, an ethno-linguistic group mainly found in Pakistan, Iran and Afghanistan are a distinct nation.’ PM Nawaz Sharif condemned her assassination and so far, no one has claimed responsibility for the attack. Ironically, her last tweet was about the discussion. 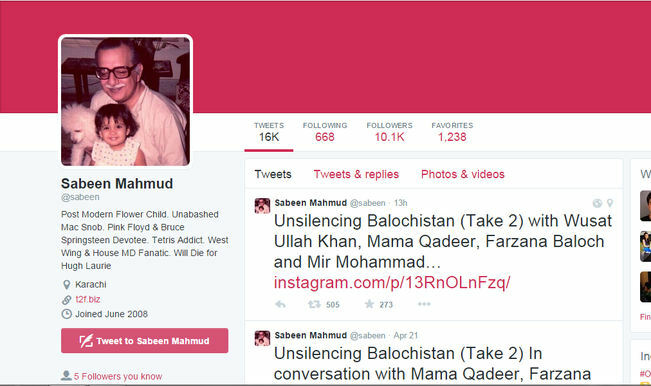 Condolences poured in for Sabeen Mahmud on Twitter.